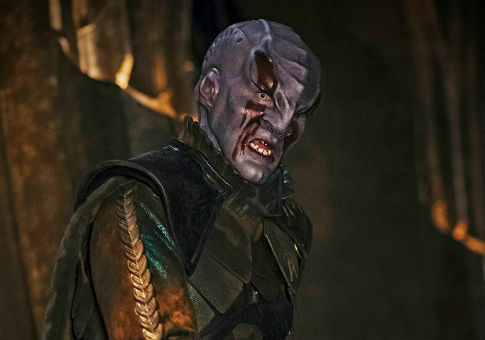 New episodes of CBS's "Star Trek: Discovery" are inspired by the post-Trump America, with the Klingons set to represent supporters of President Donald Trump. The upcoming season of the show will tell the story of a war between the United Federation of Planets and the Klingon Empire, which will be a loose allegory for the 2016 election, Entertainment Weekly reported Thursday. "The allegory is that we really started working on the show in earnest around the time the election was happening," showrunner Aaron Harberts told EW. "The Klingons are going to help us really look at certain sides of ourselves and our country. Isolationism is a big theme. Racial purity is a big theme. The Klingons are not the enemy, but they do have a different view on things. It raises big questions: Should we let people in? Do we want to change? There's also the question of just because you reach your hand out to someone, do they have to take it? Sometimes, they don't want to take it. It's been interesting to see how the times have become more of a mirror than we even thought they were going to be." The showrunners clearly hope that their take on the election will help bridge the divide in 2017 American politics. "The thing about the war is it takes Starfleet and the Federation and forces them to examine their ideas and ethical rules of conflict and conduct," Harberts said. "It provides a backdrop to how we want to be as a society and that analysis and self-reflection is new for Trek. They've done it in certain episodes in the past, but this is a true journey for the institution in itself." The official Star Trek website describes Klingons as a "well-statured warrior race [that] has a genetic predisposition to hostility and a well-known streak of fatalism." It also notes that, "the Klingon people hold honor above life — although as with any culture, high-level politics and personal gain get in the way. In Klingon culture, lower-ranked officers consider it a duty to kill off a superior who is perceived as weak." The series is apparently set also to be an allegory for on-going tensions between the U.S. and North Korea, in addition to one about President Donald Trump's election. "North Korea is in our thoughts as we finish the series," Harberts said. "What began as a commentary on our own divided nation — in terms of Trump supporters and non-Trump supporters — has blown out to North Korea and how we're right on the brink. [The U.S. is] actually right at the place where Starfleet finds itself in episode one and we couldn't have anticipated that happening. But how do you end conflict when both sides have such strong opinions?"